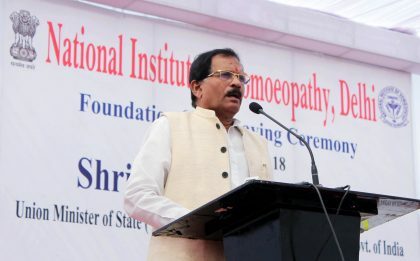 New Delhi: Union Minister of State for AYUSH Shri Shripad Yesso Naik laid the foundation stone of National Institute of Homeopathy at Narela, today. This will be a National level Institute and would be established as an extension of National Institute of Homoeopathy, Kolkata. Addressing the gathering Shri Naik said that Homoeopathy is gaining acceptance and growing in popularity all over the world and in India, Homoeopathy has also become very popular throughout the country. The Minister further said that the Ministry has taken various initiatives to develop, promote and accelerate the AYUSH systems in the country. He said “In order to bring uniformity in the admission of students in AYUSH institutions and to ensure that meritorious students come to AYUSH streams, from the year 2016-17. The Ministry has started the admission process into AYUSH UG courses by using the merit list of National Eligibility Entrance Test (NEET) conducted by CBSE. Further, for Post Graduate courses, a National level common entrance test namely, All India Post Graduate Entrance Test (AIAPGET) was conducted”. MP North West Delhi Dr Udit Raj, and Mayor, North Delhi Municipal Corporation Shri Adesh Gupta, were also present on this occasion. This National Institute of Homoeopathy, Narela, Delhi will be established in 10 acres of land which has been taken over from DDA. The total ground coverage area will be 50000 square meters. The institute is proposed to be a 100 bedded hospital and centre of excellence in quality education and research and targeting only Post Graduation and PhD level teaching to fill up the gap in high-quality research and treatment in Homoeopathy. The total cost of the project would be Rs. 302 crore. The institute will offer Post-graduate courses in seven disciplines. The intake of PG students will be 7 students per Department per Academic Year. The intake of PhD students will be 10 students per year. The OPD part of the hospital will consist of general and speciality clinic.